In today’s technologically-driven world, digital marketing is making its mark as an influential force for businesses wanting to effectively market their brands. The term digital marketing encompasses any type of online marketing effort—from email promotions to social media, from search engine ads to cell phone apps. As a marketer, you want your brand to be visible where potential customers are already spending a significant amount of their time, which these days is online. At The University of West Alabama Online, our Continuing Education e-Learning program has a selection of course and certificate offerings relevant to digital marketing. 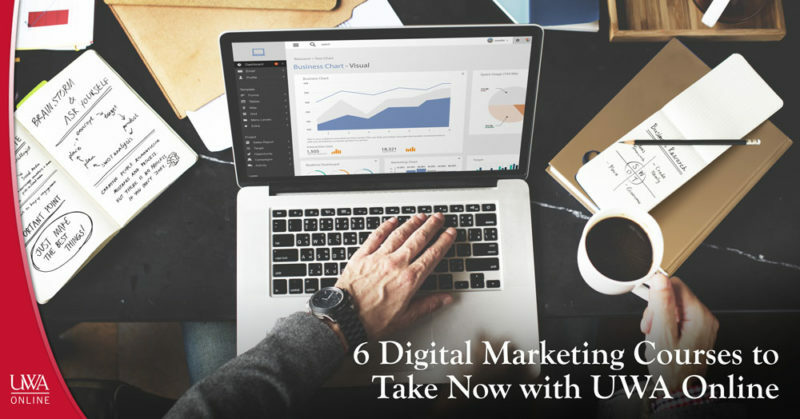 If you want to sharpen your online advertising skills, check out these digital marketing courses that you can take now with UWA Online! Explore major social media accounts like Facebook, Twitter and LinkedIn and learn how to use them to form a marketing plan for your business. You will also learn which social media platforms are best suited to achieve certain goals, and how blogging can serve as a means of attracting followers to your organization. Register here. Mobile marketing is growing at a rapid rate and is already a multi-billion dollar industry worldwide. Because the way consumers are interacting with brands is evolving, marketing must adapt as well. In this course, you’ll learn about concepts like location based marketing, mobile payments, QR codes, apps, mobile coupons and social networking in relation to smart phones. Register here. Potential consumers respond better to video rather than to static media. In Video Marketing 2972, participants will learn how to use simple but engaging online videos to connect with a digital audience, drive website traffic and enhance brand awareness. This course will show you that you do not need fancy, expensive equipment to shoot and produce an effective video. Register here. Social media is a tool that you can use to organically grow your business following. Learn which social media tools are right for you and how you can integrate them into your existing digital marketing assets, such as your website. Participants who successfully complete the course will be equipped to develop a social media strategy that is both efficient and easy to follow. Register here. Discover how to use email to boost your brand with concepts like when to email, what to email and how to test and analyze email response rates. Learn how to craft a catchy subject line to improve open rates, as well as how to format your email promotions so that they appeal to your followers. Register here. Your website is not serving a purpose if people aren’t looking at it. Get acquainted with using search engine optimization to increase your brand’s visibility and drive traffic to your site. In addition, learn how you can enhance the appearance of your website to keep visitors there—and to keep them coming back. Register here. Digital marketing courses like these can help you stand out among your industry competition and successfully attract followers to interact with your digital assets—ultimately generating more leads for your business. These online courses are open to anyone, anywhere with an internet connection. To learn more about these and other UWA Online Continuing Education e-Learning courses, visit www.uwa.edu/ce today! What’s in a name? If you are a resident of Livingston or attend the University of West Alabama, you see “Livingston” every day on your paperwork, road signs and buildings. However, have you ever thought about Livingston’s namesake? Livingston, Alabama, known for its Bored Well and the University of West Alabama, owes its name from an American jurist and statesman, Edward Livingston. The seat of Sumter County with a 2010 census population of 3,485 was originally a portion of Choctaw Indian territory until 1830, when the Treaty of Dancing Rabbit Creek—signed between the U.S. government and the Choctaw—removed territory from the native Americans. Incidentally, the city of Livingston’s namesake has nothing to do with the town itself, nor its formation. Edward Livingston hailed from Clermont, New York and lived an accomplished life. 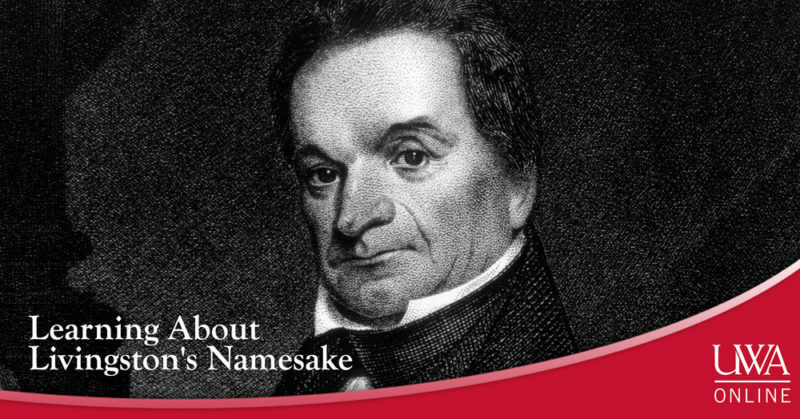 For five years (March 4, 1795 – March 3, 1801), he was a New York representative before becoming the 46th mayor of New York City in 1801–1803 while also being a U.S. Attorney for the same state. When New York City was overwhelmed by yellow fever, Livingston’s namesake worked tirelessly to relieve the burden of the disease, earning many citizen’s respect and favor. Unfortunately, his personal affairs had fallen into a state of disarray, and he was indebted to the government due to a confidential clerk out of mismanagement or dishonesty. Resultantly, Edward Livingston shortly resigned from office in 1803, surrendered his property, and took to New Orleans, Lousiana. At the time, New Orleans was simply the Territory of Louisiana, to which our Livingston’s namesake had some connection: the negotiation of the Louisiana Purchase had been done by his brother, Robert R. Livingston. Edward Livingston later paid off his debts in 1826 after building an accomplished law firm. Livingston’s namesake is perhaps best known for his assistance in drafting the Louisiana Civil Code of 1825, which accumulated sources from French, Spanish, Roman, and common law. While this law set is considered more diverse than most of the 50 states, Louisiana’s civil code is similar to that of the U.S. federal government in administrative law, procedural law, and the U.S. Federal Rules of Civil Procedure. Thereafter, Livingston prepared a new criminal law and procedural code that become known as the “Livingston Code,” and was written in French and English. The “Livingston Code” was well-praised by several countries, many of which undertook the code. Much of its praise went to the code’s philanthropy in terms of prison reform and discipline, where it called to abolish capital punishment and encourage remediation for prisoners rather than strict punishment. Edward Livingston would become the Louisiana’s U.S. representative and the first to serve in Louisiana’s 1st congressional district. He alone wrote many of the chapters and all of the contracts in Louisiana’s 1825 legislation. Later in life, he was elected U.S. Senator from 1829–1831 and then the President Jackson’s U.S. Secretary of State (1831–1833). Livingston’s namesake eventually became the U.S. Minister of France from 1833–1835, and would later return to the state of New York, where he died at the age of 71 in Rhineback. Feel more informed about this West Alabama college town? For more insight into the culture of Livingston and the surrounding area, continue to follow the UWA Online Continuing Education e-Learning blog! To browse our course offerings, and register for classes, visit www.uwa.edu/ce! Has becoming a sommelier always been on your bucket list? Or maybe you’re just trying to figure out what the word means? For those interested in getting to know wine beyond the label on the bottle UWA Online Continuing Education e-Learning can help. 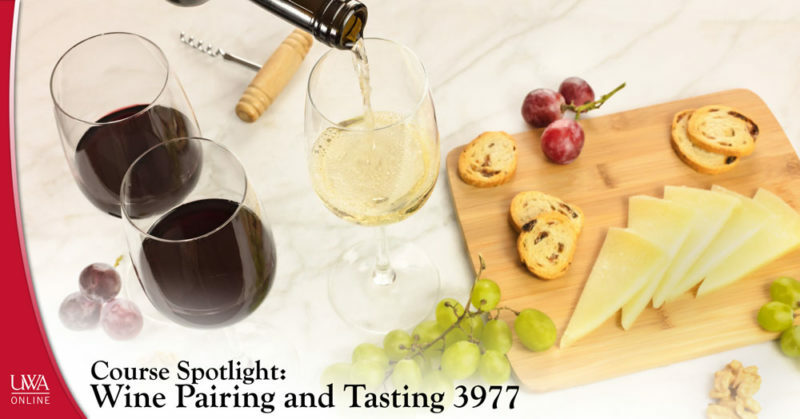 The e-Learning course, Wine Pairing and Tasting 3997, serves to teach participants the art of pairing food dishes with the specific wine that will enhance the tasting and dining experience. In Wine Pairing and Tasting 3977, participants will learn about the art of serving wine as a means of enhancing the dining experience. The course will provide an in-depth look into the process of wine tasting, which involves using one’s senses to examine and evaluate wine. Those who successfully complete the course will be better able to speak intelligently about wine and why certain types pair well with specific foods. The instructor for Wine Pairing and Tasting 3977 is Chris Thornton, owner, operator and C.E.O of Bottles up Bartending School. Thornton conceived and implemented the original curriculum that the bartending school currently uses. This course is $399 and is open for registration through Dec. 15, 2017. Impress your friends and family and become a true wine connoisseur in your spare time by registering for this course through UWA Online Continuing Education e-Learning! To register for this course, or to browse our other course offerings, visit us at www.uwa.edu/ce today! When you go to college or a trade school, you are working to prove that you possess an adequate or beyond adequate amount of knowledge to perform a task, advise on a subject or occupy a specific role in the work force. A professional certification serves essentially the same purpose—to show that you are qualified for a certain job or duty. UWA Online’s Continuing Education e-Learning program offers the opportunity for participants to earn certifications in a number of specialized topics. 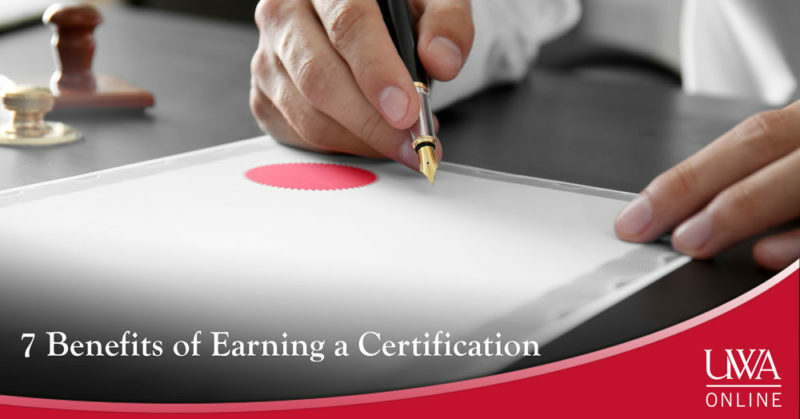 Let’s look a little closer at some of the benefits of earning a certification and how it can lead you toward achieving your career goals. It makes you more competitive. Part of making yourself more marketable has to do with poising yourself to stand out among the competition. If you are vying for a job opportunity and you have a relevant certification that other applicants do not have, then you automatically have a leg up on the competition. It can earn you more money. Ding ding ding! Earning a certification in some instances can instantly bump you into a higher salary bracket. Though the courses required to earn the certification likely cost money, the investment is worth it for the payoff you will probably receive in the long run. It connects you with your industry peers. Once you have a certification, you are more likely to cross paths with others in your field who have the same or similar ones. This may happen at conferences, via social media groups or even by meeting them through the certification courses you take. It equips you with the knowledge you need to advance. Perhaps the most obvious of the benefits of earning a certification is the fact that you are actually learning and acquiring more specialized, specific knowledge. This is the information you will house and exhibit competency with to make those next steps in your career. It qualifies you to mentor or oversee others. Earning a certification can empower you to be someone from whom others learn. If you have never served in an advisory capacity or a position in which you manage others, then a certification could be the key to landing you that role. It can help you change career paths. Looking to make a change in your career? Completing courses to earn a certification can help you do that. Rather than going back to school for four years, certification courses are shorter-lived, meaning you can jump to your new area of interest more quickly. It proves your desire to continue learning. Earning a certification is part of continuing education. Potential employers who see that you took the initiative to work for a certification on your own accord will be impressed by your thirst for knowledge and desire to make yourself better. Beyond these benefits of earning a certification, keep in mind that the process can be simple, flexible and fun! With UWA Online Continuing Education e-Learning, all of our certification courses are available online so that you are able to work at your own pace and from the comfort of your own computer. To browse our certification selections, visit us at www.uwa.edu/ce! Every day is a good day to appreciate your father; nonetheless, Father’s Day is an opportune holiday to show your dad you care about him and appreciate all he has done for you and your family. Unfortunately, no dad is perfect, and pop culture television and movies has, in many cases, excellently illustrated the fallibility of our parents. 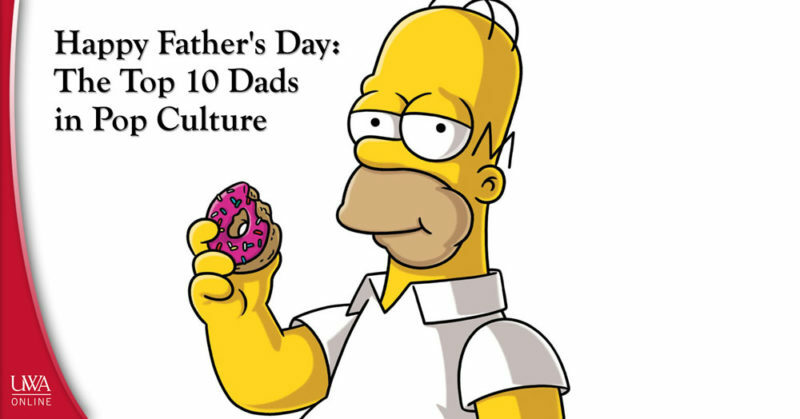 In honor of the holiday, we’ve put together a list of our vision of the top 10 dads in pop culture—the sort of dads who aren’t perfect, but who have done their best. For the sake of subjectivity, the characters listed are not put in a particular order; furthermore, you have been warned: spoilers ahead! Stoick the Vast, How to Train Your Dragon (2010). Featured in the DreamWorks Animation franchise, How to Train Your Dragon, Stoick the Vast is the father to our lanky protagonist, Hiccup. Stoick’s ignorance and intolerance is the source of tension between him and his son, but Hiccup’s determination and Stoick’s love for Hiccup creates an upward character development that creates a strong father and son relationship. Homer Simpson, The Simpsons (1998–present). The well-known animated American sitcom, The Simpsons, tells the story of a 5-person, middle American family with Homer as the careless, comedic father and husband. Homer Simpson falls within our top 10 not just because of his acclaim in pop culture but as a character that embodies the negative working class stereotype—neglectful, alcoholic, ignorant—but nonetheless dedicated to his family. Fallout 3, a first-person, open-world roleplaying video game, is a vision of a post-apocalyptic world devastated by nuclear warfare. The player character is raised by his father, James, a former denizen of the wasteland, in an advanced, long-term fallout shelter. James is featured on this list for his dying sacrifice for his offspring and the wasteland: clean, un-irradiated water. Hank Hill, King of the Hill (1997–2009). King of the Hill is another animated American sitcom to feature a famous dad in pop culture: Hank Hill. The television show takes on a more realistic yet comedic approach to the middle class family where Hank Hill is an honest, hard-working dad but with a streak of the traditional, politically conservative man struggling to show emotion. Despite his personal deficiencies, Hank is a loving father and husband and an important dad in pop culture. As far as the Marvel Cinematic Universe goes, we don’t discover Clint Barton’s family until Avengers: Age of Ultron (2015), when the Avengers ensemble take refuge at Barton’s secret homestead. As a special agent of a fictional counter-terrorism agency, it must be difficult to fight terrorism (and sometimes extra-terrestrial beings) while worrying about a family back home. By the end of Avengers: Age of Ultron, Hawkeye retires and returns to his family. For his loyalty as an Avenger and to his family, Clint Barton makes it on our list as a top 10 dad in pop culture. Christopher Nolan’s dismal yet hopeful vision of a dystopian, post-truth future features the widowed ex-NASA pilot, Joseph Cooper, and father of the fiercely intelligent daughter, Murphey, and practical son, Tom. Cooper makes it on this top 10 list for his extraordinary sacrifice: risking his life and his relationship with his children to embark on a space-travel mission to save humanity—and most importantly his children—from extinction, when all odds are against him and his team. Making it onto our top 10 dads in pop culture is a character from the comedy-drama Glee: Burt Hummel, father of Kurt Hummel, a member of the glee club at fictional William McKinley High School. One of Kurt’s driving storylines is his identity as a homosexual teenager and his resulting struggle against abuse and prejudice. Burt makes it onto this top 10 list because of his refreshing acceptance and love for his son. What top 10 dads in pop culture list would be without at least one father from Harry Potter, the fantasy novel series by J.K. Rowling? Mr. Weasley makes the list for his devotion to his enormous family and compassion in pseudo-adopting Harry into the Weasley clan. Open-minded to the point he, a pure-blood wizard, is interested in muggle artifacts and staunchly loyal not just to his family and friends but to a cause—particularly against a certain dark lord—Mr. Weasley is an important dad to consider in pop culture. Uncle Phil, The Fresh Prince of Bel-Air (1990-1996). The quick-tempered Philip “Zeke” Banks, otherwise known as Uncle Phil in the 1990s series The Fresh Prince of Bel-Air starring Will Smith, often shows his frustration for nephew Will and daughter Vivian’s antics. However, under the surface, his strictness is only an indication of his desire to be a strong-willed, exemplary figure in his children’s lives. Though Uncle Phil is not Will’s actual father, he plays a fatherly role in Will’s live driven by a deep love and care for his family. Darth Vader, Star Wars (1977–present). A primary antagonist in episodes four through six of Star Wars, a protagonist in the infamous prequels as Anakin Skywalker, and with references and cameo appearances in other Star Wars media, Darth Vader is an iconic figure in pop culture and should certainly make it onto a top 10 dads of pop culture list. Originally Anakin Skywalker, Darth Vader turned to the dark side of the Force to save his wife and children; when that failed, he would later sacrifice his life to save his son—and restore balance to the Force. Happy Father’s Day from UWA Online Continuing Education! Stay tuned for more fun holiday activities, insights into the Livingston area, and advice on continuing education! To see what classes we have to offer via our Continuing Education e-Learning programs, call 205-652-5100, or visit www.uwa.edu/ce! A healthy body leads to a healthy mind. In Nutrition and Fitness Professional 3195, you will learn practical skills and knowledge about staying healthy and fit. The course promotes a personalized guide to fitness and wellness that are both attainable and enjoyable, and students can learn and put to practice a variety of information regarding not just nutrition and fitness but also stress management. identify the nutritional needs of a person throughout their lifespan. Nutrition and Fitness Professional 3195 is ideal for students seeking professions within the health and nutrition career market or for students interested in learning how to improve their health through an effective curriculum. At the end of a successful course, students will be able to register for the NCCB national certification exam and become Certified Health and Fitness Coaches (CHFC), providing students with the opportunity to partake in entry-level jobs as nutrition coaches. Furthermore, Nutrition and Fitness Professional 3195 will give students the tools they need not only to improve their lifestyles, but also to aid others in their journey to become healthier individuals. This continuing education course will be facilitated by an education mentor who will help guide students through the course, review students’ work and progress, and provide help and interaction where needed. You can register for this course through December 15, 2017. Additionally, certain technical materials are required for the course. Visit the bottom of the official course webpage to view required materials and equipment needed for the successful completion of this course. 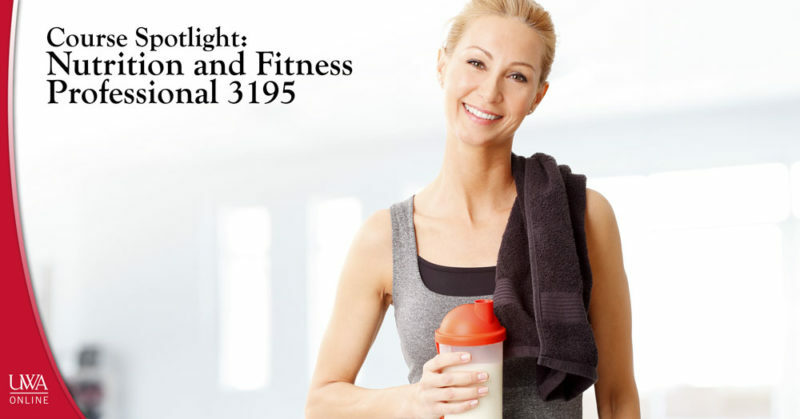 If you are interested in Nutrition and Fitness Professional 3195, click here to register for the course or here to browse for other UWA Online Continuing Education e-Learning courses. Don’t forget to visit us at www.uwa.edu/ce! Decades and centuries ago, the ability to go to school was considered a privilege, rather than a right. As time progressed, that idea shifted, and going to school for at least one’s childhood and teenage years became the norm. College then became an opportunity that only an elite few got to enjoy. Today, the number of high school students transitioning to college is higher than ever, and we now look to another tier of learning beyond college: continuing education. Whereas lifelong learning historically has been more enrichment or hobby-oriented, recently, continuing education has changed from luxury to necessity among today’s professionals. The continuing education of the past was often limited to skills that were considered “extras,” or, not critical to one’s success in the workplace—such as painting or photography, for example. Today, in considering how continuing education has changed, think about the fact that change in professional settings is constant. In order to keep up with that change, professionals have to continue learning as information in their respective fields evolves. It has essentially become a necessity to take professional development and specialized continuing education courses in order to meet the demands of a highly-competitive workforce. Think of continuing education as a way to keep your career skills relevant. Some careers may require that you earn a professional certificate, while certificate programs for others may just be an impetus for job advancement. Continuing education can also be helpful in an attempt to transition from one career to another. In addition, with continuing education becoming a necessity for more and more workers, the pool of continuing education participants has become more and more diverse—from recent college graduates to persons long-established in their careers. Fitting this type of necessity into already-busy schedules calls for flexibility—such as the flexibility that one can enjoy by taking online continuing education courses. The fact that continuing education has changed from luxury to necessity is something all workers need to embrace. Through UWA Online Continuing Education e-Learning, you can take the specialized courses needed to stay ahead in your field without disrupting your daily routine—as our entire program is online-based. There is no better time than now to enroll for a course or certificate program that can propel you to reaching your career goals! Visit www.uwa.edu/ce to browse our course offerings and register today. One week from today—Sunday, June 18, is Father’s Day 2017. For those of us that have that privilege of spending June 18 with a father, expressing gratitude is important. Just like Mother’s Day, celebrating your parents outside the holiday is significant; however, sometimes it’s nice to have a day set aside to slow down, think about your blessings, and spend time with your parents. Whether you want to surprise your father or plan something special together, gathering ideas as to what you should do may cause you to come up blank. While no one knows your father better than you or your family, we can help you with the brainstorming process. 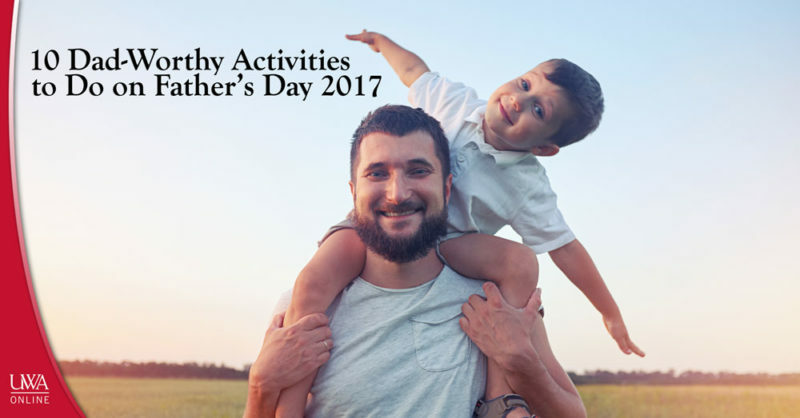 Check out these 10 dad-worthy activities to do on Father’s Day 2017! Pick whatever you think your father would like, or let him choose! As far inexpensive outings go, bowling is a nice, easy-going activity to do with your dad—or the rest of the family—on that special day. The indoors nature of bowling alleys mean you can do it in the rain, snow, heat, or cold, so long as you can weather the drive! If you have a fishing license, you might think about taking your dad fishing this Father’s Day. Fishing can be a stress-relieving activity, and you can enjoy the outdoors while relaxing with your family. Also, whatever you catch, you can throw on the grill! A good way to bond with someone is to cook with them. Whether it’s with a family or just between you and your dad, making something you can eat and enjoy is almost always a gratifying activity. Furthermore, Father’s Day is also a good reason to fire up the grill and throw on some steak, chicken, hamburgers—you name it! If you have a museum or historical site nearby, it could be a good idea to go over and visit. Visiting a museum or historic site is a good way to appreciate and become educated on art and history, and learning together with someone is often a fulfilling experience. Whether it’s simple arts and crafts or woodworking, putting your heads and hands together to create something beautiful or useful is beneficial and fulfilling. Painting, carving, or building are a few examples of the many projects you can do with your father. Nothing quite makes you appreciate the Great Outdoors like spending a night in it with just a tent over your head and sleeping bag and some cushions under you. Camping is a good way to escape real-life and relax whether you’re using tents or a camper. Grill, turn on some music or listen to the birds chirping, swim in a lake or river, or sit back and just chill with your father and family this Father’s Day! Enjoying a late-night movie in the family room or going out to the theater is another good way to spend Father’s Day. Let your dad pick the movie, sit back, and enjoy. Afterward, you can have an awesome discussion about how much you liked—or hated!—the movie. Hopefully you won’t disagree too much. Let your dad forget being an adult for a little bit. Laser tag is a creative, novel way to have fun without the mess of paintball but all the fun of running around with a make-pretend gun in your hands. Foster teambuilding skills, create exceptional memories, and get some exercise in by playing laser tag with your dad this Father’s Day. If you and your dad like music and don’t mind the crowds, pick a concert in the area and go! You may need to do a bit more planning for this, and you may not be able to do this activity on the day of Father’s Day, but enjoying a concert with your father can still be an enjoyable and memorable experience. Like camping or fishing, going to the beach lets you and your dad relax and enjoy nature. You can go swimming, get some sun on the beach, build sand castles, whatever strikes your fancy! Happy early Father’s Day from UWA Online! Whatever you and your dad choose to do this Father’s Day, have fun, and enjoy your quality time spent together! Stay tuned for more activities, insights into the Livingston area, and information about continuing education e-Learning! To see what classes we have to offer via our online continuing education programs, call 205-652-5100 or visit www.uwa.edu/ce! In the world of sales, volume is everything when it comes to making money. If you are starting a career in sales—or are already a salesperson looking to increase your sales volume, “Getting Started in Sales 3060,” a continuing education course through UWA Online, could provide the boost you need. 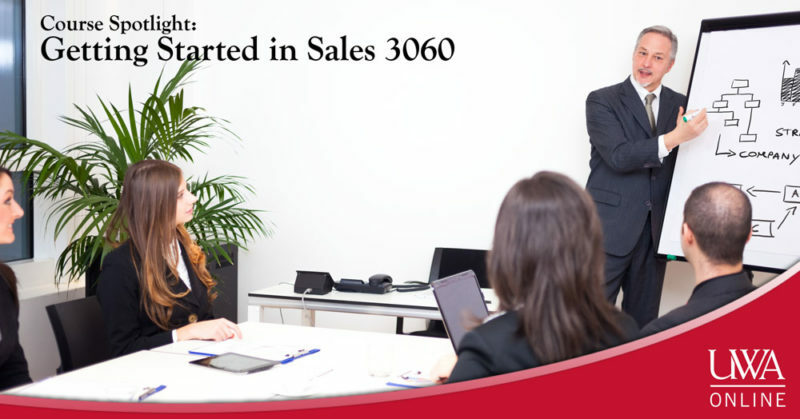 By the end of Getting Started in Sales 3030, those who successfully complete the course will be comfortable with prospecting for new customers, will be equipped with new and inventive strategies to intrigue sales prospects and will have mastered the art of keeping the sale closed, among other achievements. The instructor for this course is Tim Street, an American writer, producer and director who has been lauded by CNN, The Toronto Star and Wired News for his work with web television. Getting Started in Sales 3060 is being offered July 3 through 29 and October 2-27, 2017! To register for this or other UWA Online Continuing Education e-Learning courses, visit www.uwa.edu/ce! The benefits of continuing education are not difficult to discern: the nature of the phrase itself says it all. It is the act of continuing your education to sharpen your knowledge about a topic and better equip you to achieve what it is you want to achieve in life. 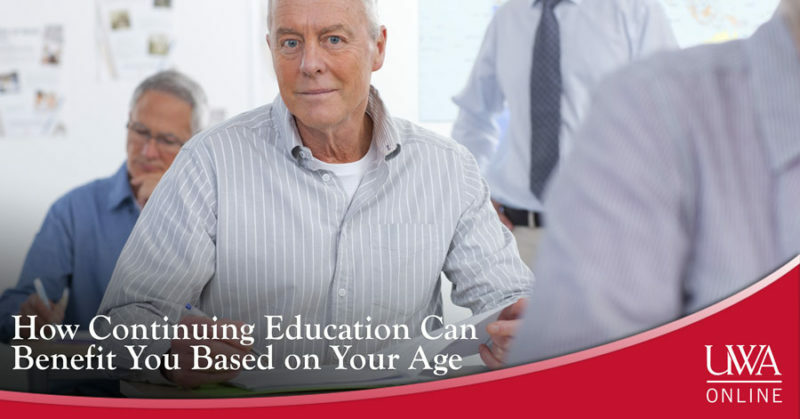 While the overarching purpose for continuing education is generally uniform across the board, continuing education can benefit you in different ways based on your age—and what stage of life you are in. One of the great qualities of continuing education is the fact that it is so non-discriminating—that it appeals to persons of varying demographics, situations and life backgrounds. At UWA Online, our Continuing Education e-Learning program is open to anyone, regardless if you are a college student, career person or otherwise. Learn more about how continuing education can benefit you based on your age. Young adults. Taking non-credit continuing education courses as a high schooler or high school graduate is an opportunity to discover what you are interested in. For example, if you suspect that you may want to study finance in college, take an online introductory finance course to find out if it is actually a subject you want to pursue. College students or recent graduates. People in this age bracket can benefit from online continuing education as a way to supplement the studies they are currently completing or have just concluded. It can be a way to further specialize within your major, setting you up to be more suitable for the specific job you are soon to be applying for. Young professionals. Continuing education for those who have recently entered the workforce is a means of making yourself more marketable by adding useful career skills to your resume. With the flexibility that online continuing education courses afford, you can work at your own pace in your free time while still working full time and earning a certificate that can help you in your career down the road. Established working people. When you have been engulfed in your career for decades, it can be easy to get set in your ways and overlook new industry innovations, ideals and standards. Continuing education is a way to keep yourself up to date on the latest and greatest ideas in your field. Earning a certification is also a way for you to give yourself the advantage if you are eyeing a promotion. Retirees. The benefits of continued learning as people age are still being studied, but research thus far suggests that lifelong learning can provide positive life-changing benefits for elderly persons both mentally and emotionally. Not only can online continuing education courses keep your mind sharp by helping you stay active mentally, but they can also improve quality of life by occupying your time with activities you enjoy. You can pick up a hobby in retirement by signing up for non-credit continuing education courses. Continuing education can benefit you in numerous ways across various times in your life. No matter how old you are, the value of learning something new is never something to discount. To learn more about what UWA Online Continuing Education e-Learning has to offer, visit us at www.uwa.edu/ce.